Readers of ChannelPro-SMB were invited to participate in the SMB-focused Readers' Choice Awards by casting their votes for the vendors, distributors, and professional organizations with the most SMB- and partner-friendly solutions, services, or programs in the channel today, via the publication's website. For each of the 55 categories, readers were asked to select the option that best satisfies the unique business requirements, work styles, and budgets of their small and midsize business clients, as well as those that best serve their own partner organizations. 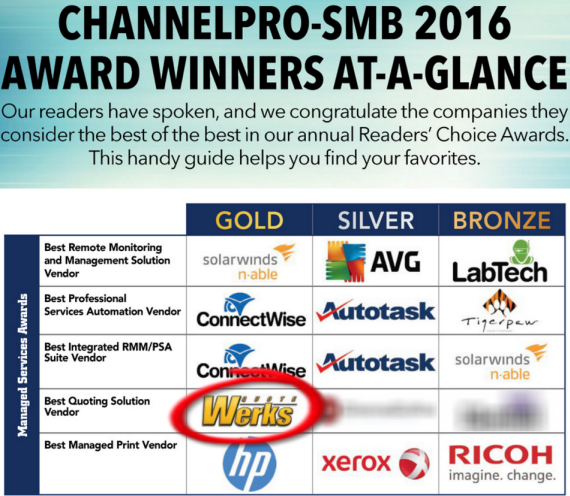 We are honored that the readers of ChannelPro-SMB voted QuoteWerks as the Best Quoting Solution. Part of our success is that we listen to the needs of the IT Community and continue to innovate as a CPQ solution that enables our customers and partners to succeed. This award is a testament to that. The multiple-choice survey, which provided space for write-in responses, was fielded between February 26 and April 1, 2016 and drew participation from more than 500 channel VARs, MSPs, integrators, system builders, and IT consultants. Gold, Silver, and Bronze winners are named in each category. Orlando, FL, (PRWEB) July 5, 2016 — Aspire Technologies, Inc., the market leading provider of sales quoting and proposal software solutions, announced today that they were awarded as the Gold Winner in the "Best Quoting Solution Vendor" category. 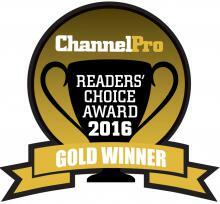 In the four years that ChannelPro-SMB has presented awards in this category, QuoteWerks has won Gold each year. "We are honored that the readers of ChannelPro-SMB voted QuoteWerks as the Best Quoting Solution," said Brian Laufer, Vice President of Aspire Technologies, Inc. "Part of our success is that we listen to the needs of the IT Community and continue to innovate as a CPQ solution that enables our customers and partners to succeed. This award is a testament to that." "We are gratified that such a large number of readers participated in our survey, underscoring their commitment to, and understanding of, the SMB market and the vendors, distributors, and professional associations with whom they partner," said Cecilia Galvin, executive editor of ChannelPro-SMB. "The results are a true snapshot of the top IT product and service providers in today's SMB channel." This has been an award winning year for QuoteWerks. In addition to this award, QuoteWerks was recognized as one of two solutions honored as Best Managed Services Tool by Business Solutions Magazine in January. QuoteWerks has also won "Best Partner Involvement" at four ASCII IT SMB Success Summit events this year.